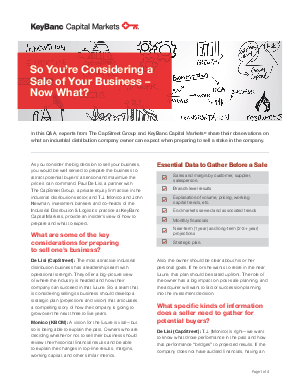 > KeyBanc Capital Markets > So You’re Considering a Sale of Your Business – Now What? Gather essential data/metrics to gather before the sale (sales, margin, volume, pricing, working capital, end markets, monthly financials, near- and long-term projections, etc.). Articulate the strategic direction and vision for the future. Avoid common mistakes when preparing for the sale of a company. Address common misconceptions about private equity firms. Collaborate with the right private equity partner to ensure a successful sale.